It’s snack time and your child is hungry. You serve what you think will be a delicious, simple snack to fill their belly and help them grow. But they only want crackers, or bread, or something sweet, or crunchy, or salty, or mushy or _____________ [insert your own child’s favorite snack here]. With summer around the corner, parents have an opportunity to reset the snack clock and bring more nutritious snacks into their routine. The CDC encourages parents to “help children learn to be aware of what they eat by developing healthy eating habits, looking for ways to make favorite dishes healthier, and reducing calorie-rich temptations.” Easier said than done. 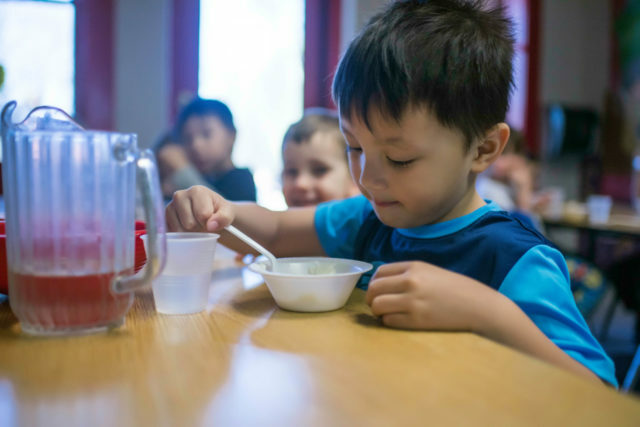 Whether it’s at a childcare facility, a camp setting, or around the kitchen table, always strive to find a balance between healthy snacks with nutritious values and snacks that children will actually eat. Serving snacks family-style gives children a choice regarding which food and how much of it is put on their plate. It also encourages more adventurous choices because if a friend is trying something, a picky eater may want to, as well. Fruit cones: Pile fresh fruit and berries into an ice cream cone. It’s a fun presentation inside a tasty treat! Homemade sorbet and smoothies: Combine yogurt and fruit then chill or freeze to perfection. Homemade ice pops: Freeze fresh juice or lemonade and add strawberries, kiwi or other fresh fruit. Or simply buy a watermelon, cut it up, insert a popsicle stick and freeze. Voila! Fruit-infused water: A great alternative if water is getting boring. Fruit and veggie skewers: Place fruits and veggies on wooden skewers to create a mix great for sharing. Keep two to three servings of fresh fruit and veggies washed, cut and ready to eat with a dip or hummus. Include your children in the snack preparation process. Let them pick a new, healthy fruit and then prepare it alongside you. Check snack food labels to find options with low daily values of sodium. The FDA defines a low daily value as 5 percent and a high value as 20 percent. Contributed by Alison Solomon, RN, from the Get Well Place at LeafSpring School. At LeafSpring School’s five area locations, parents and nurses partner to promote the success of each child. Your child doesn’t have to be enrolled to use our Get Well Place, which provides excellent care to mildly-ill children, or children with chronic conditions. Our Get Well Place also serves children enrolled in our nursery, preschool, private kindergarten, before and after school programs and summer camps.